Alexis Shanks brings a lifetime of experience to Aviary. “My mother was a hospice nurse, and, as a young girl, I would go with her to patients’ homes and gently rub their feet and hands. In my family, I obtained the name ‘magic fingers.’ That nickname gave me the confidence and validation that I have the gift of loving intent and touch.” But this anecdote is only one of the things that sets Aviary’s newest massage therapist apart from the crowd. For the last 10 years, Alexis’ family has run The Stillpoint Center in Taylorsville, North Carolina. Here, she learned of everything from homeopathic remedies to different modalities of massage. To further this knowledge, Alexis enrolled in The Academy Of Somatic Healing Arts (ASHA) in 2009, becoming certified in Neuromuscular Therapy, Sports Massage, Therapeutic deep tissue and Swedish massage. Her mission is to create collaborative relationships with her clients for the pursuit of optimal holistic wellness. She brings this, alongside 6 years of massaging privately, to Aviary, and we are thrilled to have her on the team! Alexis will be working Monday, Friday and Sunday. Christine Legnon will continue to be available Tuesday, Wednesday, Thursday and Saturday. 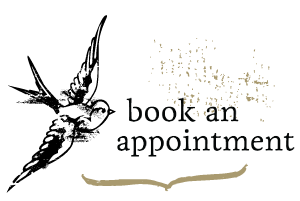 To welcome and learn more about Alexis, as well as enjoy $10 off by booking your first appointment online, click here.